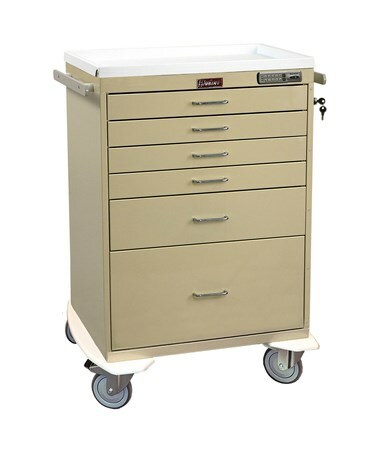 Harloff's Classic Short Four Drawer Cart with Electronic Lock features a wide range of industry-leading standards and sturdy, uni-body steel construction for an essential component of any anesthesia applications. Convenenient: Movement and security are no concern with this cart. A electronic push-button combination lock (with key override) provides keyless entry without the need for a battery, keeping your supplies secure and safe from tampering. A full wrap-around bumper on a separate stabilizing frame protects your cart and its surroundings from any collisions. Aluminum side rails/push handles (two on Standard Package, four on Specialty Package) give you control and extra accessory mounting space, and the cart moves on 5" ball-bearing, full swivel casters (1 tracking, 1 braking). Additional Features: Additional features include a removable plastic top, pre-drilled threaded holes for side mounted accessories and a 12 year warranty. The Specialty Package includes four aluminum side rails/push handles and a raised back rail system with two horizontal rails. 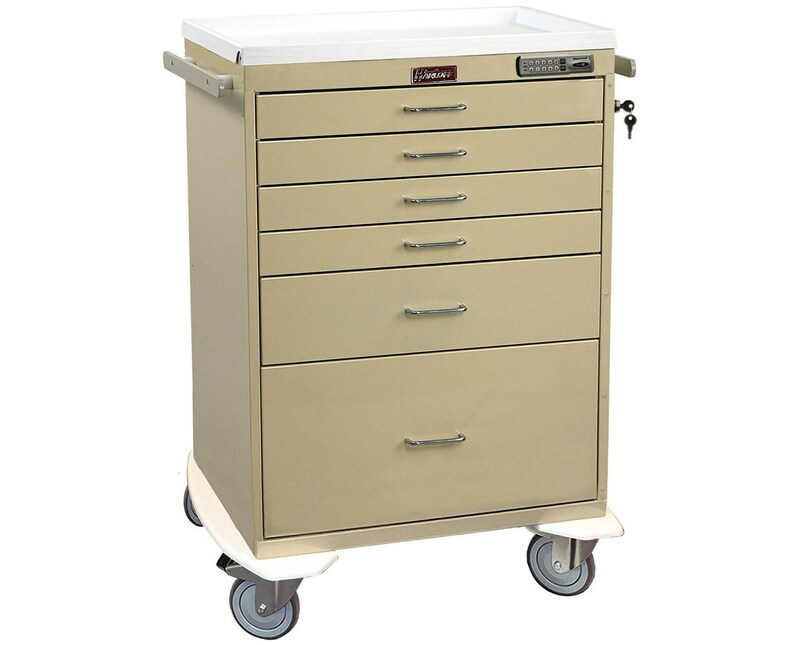 Specifications: 24" of vertical space contains six drawers in this anesthesia cart. While the cabinet and drawer design allows for customized drawer configurations, the standard setup includes (2) 3" drawers, (1) 6" drawer and (1) 12" drawer. The drawers operate on ball-bearing full extension slides and feature external handles. 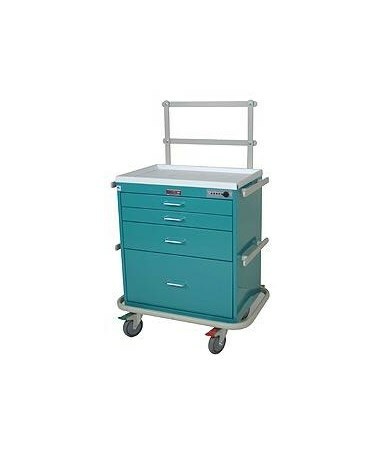 The internal drawer dimensions measure 23" W x 17" D.
We offer Harloff's Four Drawer Cart with Electronic Lock with either Standard Package or Specialty Package configurations and in 16 colors (View Chart). Select from the drop down menus above and order online direct by clicking "add to cart!" Number and Size of Drawers (2) 3", (1) 6", (1) 12"